Just when I thought I had seen the best that college tennis had to offer, the final day of the ITA National Indoors came and we arrived at a new level or, as Audra Cohen described Jelena Pandzic's game "up in a tree house." To start at the end, it was the Jelena Pandzic-Audra Cohen (pictured right) match that finished the day. It was a baseline battle -- surprisingly for two good volleyers -- that went back and forth with breaks in the first set. There was finally a hold of break at the end for Jelena and the Fresno Pacific sophomore had the set at 7-5. The second set seemed to follow the same pattern, but this time it was Audra who had the break to hold for 6-4. Although Audra breezed through the first four games of the third, there was a bit of a comeback for Jelena in the next two. It didn't last long and last year's ITA Player of the Year brought yet another accolade home to the University of Miami with a 6-2 finish. The men's singles final between Ben Kohlloeffel of UCLA and the Ohio State surprise Steve Moneke (pictured left) was a strange one indeed. Though it disappointed the hometown crowd, no one was really shocked when reigning champion Ben shut out the unseeded Steve in the first set. It was quick and easy with very few points to the underdog. The second set, however, was a different story. Whether it was a second wind or a fear of disappointing the crowd, Steve Moneke figured out what he needed to do to get in the match. He came back with some winners and played through some great points, even pushing Ben to break points and multiple deuces. In the end it was a great show, but not enough as Ben took home his second ITA Indoors title in a row, 6-0,6-4. It looks like college tennis should be ready to see a lot of the University of Georgia in the winner's circle. Luis Flores & John Isner just picked up their second major ITA National doubles title of the season after taking the ITA All-American Championships (John was also the singles winner there). This win, however, did not come easy as Marco Born & Andreas Siljestrom of Middle Tennessee put up quite a fight. Though it was only supposed to be an eight-game pro set, the servers' duel seemed to go on forever with few long points and no breaks to 8-8. The two teams headed into the tiebreaker with no end in sight until Middle Tennessee took a break at 4-4. It didn't last long as Georgia broke back -- twice -- and took the trophy at 9-8(4). While the men's doubles was all serve and a little volley, Megan-Moulton Levy & Katarina Zorcic of William & Mary showed the crowd what exciting doubles was all about. Anyone who had seen Megan play already knew that she was no stranger to the net. She and Katarina made a great team as they played the entire court to a 8-3 win over the unseeded team of Ana Cetnik & Anna Sydorska of TCU. In a twist of fate, it was actually the No. 1 seeded team vs. the No. 2 seeded team in the women's consolation doubles final. Notre Dame's Catrina & Christian Thompson just couldn't get it all together today and the second-seeded Zsuzsanna Fodor & Suzi Babos of the University of California who prevailed, 8-6. Suzi was not victorious in consolation singles, though. She fell in a real nailbiter to Stanford's Celia Durkin (pictured below), 6-2,6-7(1),7-5. I only got to see a few of the great -- and controversial -- points of this match because it took place at the same time as the main draw matches. 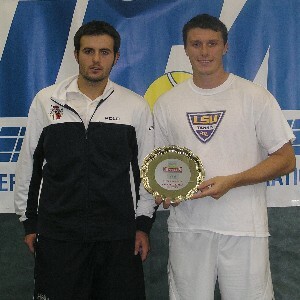 In the men's consolation final, Arnau Brugues of Tulsa defeated LSU's Ken Skupsi (pictured left), 6-3,6-3. It was another great event at the Racquet Club of Columbus. Tournament Director Al Wermer, Ohio State Coaches Ty Tucker & Chuck Merzbacher and a host of volunteers made it a welcome event.